In a poem, mind you. Possibly one of the reasons that makes the poem, the longest poem ever. So you have heard of the vile Duryodhan and of course his younger brother, Duhshasan. Ever wondered if the rest of the ninety-eight brothers ever existed? And if they did, who were they and how come they never showed up in the story – doing something specific. Well, here are the names of all the hundred Kauravs. They were a hundred and one brothers, mind you and even had a sister. But you probably know that. The daughter’s name was Duhssala, you’d recall she is the one who married Jayadrath. The hundred and first brother was Yuyutsu, who was Dhritarashtra’s son by a Vaisya wife. The easiest, shortest definition would be – a battle unit in the Mahabharat. You will find some description in Wikipedia and another related article here. An Akshauhini was a specific ratio of foot soldiers, chariots, horses and an elephant. A single Akshauhini comprised of two hundred and eighteen thousand and seven hundred (218,700) “units”. Now, “units” is slightly misleading because it doesn’t necessarily mean those many persons. In my opinion there were more. The x3 and the x10, of course, represent the multiple of the unit below it, i.e. a Gana was three times the Gulma. 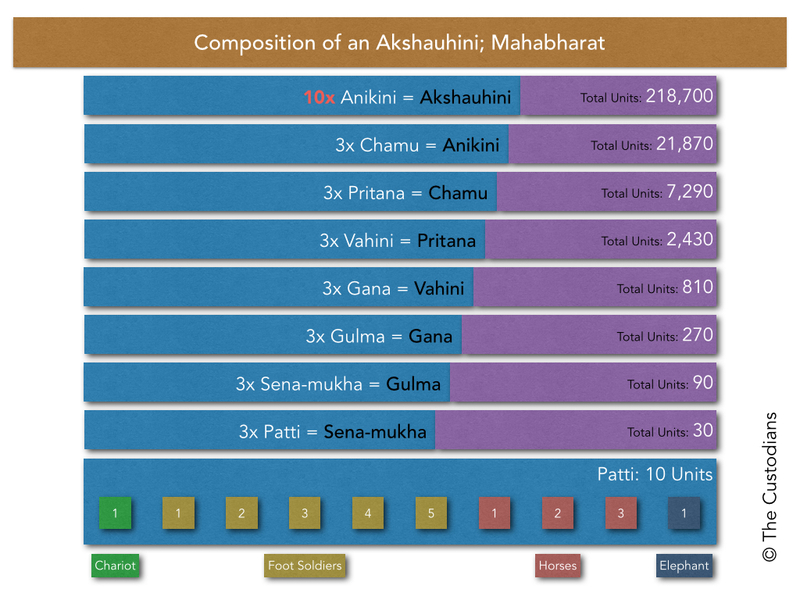 Each unit is three times its previous unit – except for the Akshauhini itself – which was ten times the Anikini. Now that’s a something to think about. Was there a good reason why the last unit was a multiple of ten, rather than three? Now, lets go back to thought of how many ‘persons’ were actually there in an Akshauhini. In a Patti, the base unit, there were five foot-soldiers, and we can assume that one horseman over the three horses; makes it eight ‘persons’. Do we count the chariot-driver and the elephant-driver (mahout)? Obviously these people didn’t fight – they steered the vehicle or the animal. And of course we don’t know if the chariots were drawn a single horse or a couple of them. When you do these combinations, of course, the entire number game changes and we have much more people (and animals) fighting in the Mahabharat War. Of course the most important fact is that there were eighteen Akshauhini’s (both sides – I do not know the break up – but we all know that the Kaurav army was larger than the Pandav army) that fought the famous Mahabharat war. That means, there were three million, nine hundred and thirty-six thousand and six-hundred (18 x 218,700 = 3,936,600) people who fought the war. And of course you know how the war ended – in eighteen days and a night – these three million, nine hundred and thirty-six thousand and six-hundred were slain. All of them. Mahabharat is known as an epic poem – and of course there are enough arguments of whether it is fact or fiction. I am not making that argument – that is not the point of the post. What intrigues me most – is that if this be a work of literature or a moral book – imagine the level of detail in the poem. References: Wikipedia and The Internet Sacred Text Archive. The entire Mahabharat is available unabridged and online at the The Internet Sacred Text Archive. It is an amazing initiative; see if you can support them in any way.